On that same day two of Jesus' followers were going to a village named Emmaus, about seven miles from Jerusalem, and they were talking to each other about all the things that had happened. As they talked and discussed, Jesus himself drew near and walked along with them; they saw him, but somehow did not recognize him. Jesus said to them, "What are you talking about to each other, as you walk along?" They stood still, with sad faces. One of them, named Cleopas, asked him, "Are you the only visitor in Jerusalem who doesn't know the things that have been happening there these last few days?" As they came near the village to which they were going, Jesus acted as if he were going farther; but they held him back, saying, "Stay with us; the day is almost over and it is getting dark." So he went in to stay with them. He sat down to eat with them, took the bread, and said the blessing; then he broke the bread and gave it to them. Then their eyes were opened and they recognized him, but he disappeared from their sight. Have you ever noticed that some of the saddest words in our language begin with the letter D? For example, disappointment, doubt, disillusionment, defeat, discouragement, despondency, depression, despair and death. Movie producer Woody Allen once gave the commencement address at Yale University. He said the following: "Our civilization stands at the crossroads. Down one road is despondency and despair. Down the other road is total annihilation. I hope we'll take the right road." Woody Allen was obviously trying to be funny, but his statement reflects the despair and pessimism of our times. Disappointment, doubt, disillusionment, defeat, discouragement, despair and death - all of these words sum up how Cleopas and his companion were feeling as they trudged up the road toward Emmaus. They had left the downhearted and confused band of disciples who were afraid and bewildered over what had happened to Jesus on Good Friday. The two men, as they travelled along, were also sad and disillusioned. The Master they had loved and followed had been horribly put to death – a cruel and degrading death on a cross. Jesus had been made a public spectacle, exposed to the jeers of all who passed by. Only a week before, their hopes had risen to fever pitch when the excited crowds welcomed their Master waving palm branches and shouting ‘hosanna’. But now Jesus lay dead in a sealed tomb. Their hopes were dashed; the dream was over! Even the report of the women that Christ’s tomb was empty didn’t raise their spirits; it only confused them even more. The two despondent disciples walking the road to Emmaus summed up the situation very neatly when they said, "We had hoped that he would be the one who was going to set Israel free!" Human hope is a fragile thing, and when it withers, it’s difficult to revive. We need to note the number of people who take their own life because despair and discouragement have sucked the last bit of hope out of their lives. When someone you love and care for is overtaken by a serious illness, which goes on, and on, despair sets in. It almost becomes impossible to hope for recovery. You may even be afraid to hope because you believe that couldn’t to cope with another letdown. "We had hoped … ", Cleopas and his friend had said. They were saying, "We don’t expect it now, but once we did. We had high hopes for the future, but now those hopes are gone and all we have left is disappointment." Can you identify with the feelings of these two disciples in any way? For each of us the cause of feeling down might be different, but it would be a rare person indeed who could claim that they were not affected by any of those D words - disappointment, doubt, disillusionment, defeat, discouragement, depression, despondency or despair. As the two men walked along, a stranger joined them. This was going to be the most significant walk in their whole lives. The stranger asked them what they were discussing. And so they poured out their story to someone who seemed willing to listen. They tell the stranger all about their hopes and their disappointments. The last thing they needed was a brisk "cheer up" talk, or being told to "snap out of it". He simply provides a listening ear. As the three men talk of their misery and disappointment, the stranger walks with them. We know that the stranger was Jesus. Isn’t that a great picture – Jesus walking along the road with his despondent and confused disciples sharing their troubles? Suddenly this 2,000-year-old story is brought into the present. When disappointment, doubt, disillusionment, defeat, discouragement, despondency, depression, and despair fill our lives, Jesus is the unseen "stranger" walking alongside us, listening to us, and if we are willing to hear his voice, revealing himself to us. As Cleopas and his friend talked about the cross, their bewilderment and sorrow, Jesus reassured them and helped them. How did he do it? He pointed them to what God says in the Bible. Luke tells us, "Jesus explained to them what was said about himself in all the Scriptures, beginning with the books of Moses and the writings of all the prophets". Jesus must have given the Emmaus travellers the best ever lesson on the Old Testament, reminding them how sin came into the world through the disobedience of Adam and Eve, and how the prophets foreshadowed a saviour who would be obedient even to the point of death. He may have reminded them of Abraham - how he almost sacrificed his son - and how the heavenly Father did sacrifice his Son for the sin of all people. No doubt, he would have referred to Isaiah’s description of the Suffering Servant of God who "was wounded for our transgressions, crushed for our iniquities" (Isaiah 53). It’s not that these men hadn’t read their Bibles, but that their understanding was clouded by the idea that the Messiah would come with glory and power and rain down fire on their enemies. The two-hour walk to Emmaus must have seemed like five minutes. The two disciples could feel the despondency and sorrow they felt in their hearts change into understanding and hope as the "stranger" explained that Jesus’ death was a part of God's great plan of salvation. When disillusionment, depression and defeat dominate our lives, Jesus walks with us just as he walked with the two men on the road to Emmaus. He points us to God's Word of promise in the Bible that tells us again that we are God's dearly loved children and that he will stand by us through thick and thin. He turns our despair into hope. Some years back I knew a woman who was dying of a brain tumour. She had struggled with the disease for a number of years. She went through surgery, radiation and chemotherapy, and all the ills associated with both the disease and its treatment. I asked her about how she felt about the whole ordeal and where it was surely leading her. She said that it was very difficult at times; she knew she was dying, but even so she felt an astonishing amount of peace and joy. When I asked her if she was scared of what lay ahead in the future, she replied, "Why should I be afraid? I believe in Jesus, my Saviour. I know where I came from and where I am going." Like the disciples on the road to Emmaus, she was comforted by her Saviour. Even though there were times when she was depressed and sad, she knew she wasn’t walking alone. He gave her hope for the future; a hope that only her risen Saviour could give. She was blessed and she felt it - and those who visited her knew it. The two disciples asked the "stranger" to stop with them for the night and at the evening meal he "took the bread, and said the blessing; then he broke the bread and gave it to them". Suddenly it dawned on them who the stranger was. It was their Master raised from the dead. Jesus himself had ministered to them in their sadness. Now they knew why a change had come over them as they walked on the road. They now knew why their despondent hearts had been changed to hearts filled with hope and renewed faith. Jesus had revealed himself to them in his Word and through the sacrament. I can imagine Cleopas and his friend standing in amazement; perhaps embracing in great joy, asking each other, "Wasn't it like a fire burning in us when he talked to us on the road and explained the Scriptures to us?" Their world had come together. They had experienced something of the grace of God. Because of his love for his despondent disciples, graciously Jesus came and met them on the road to Emmaus. Graciously he cleared away the fog of confusion; he showed to them the heart of God and his plan of salvation, and finally he revealed himself to them – he was alive, risen from the dead. At the moment the "stranger" reveals who he was, he vanishes from their sight. But he has not gone; he is still visible to those who have the eyes of faith. 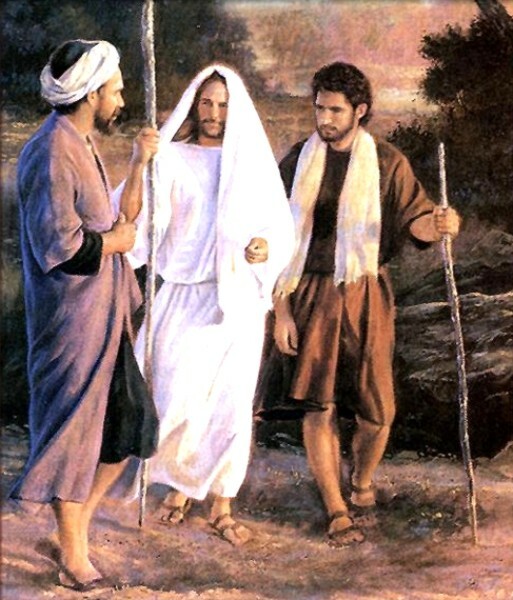 The road to Emmaus is a symbol of the Christian life. This story is about ordinary despair, and ordinary, Monday-morning drudgery. It is a story about meeting a stranger, hearing his words of comfort, sitting down at table and sharing a meal. This is story about the meaning of Easter for us. It enables us to see that the risen Lord gives hope and joy, when all we see is disappointment, discouragement and despair. It enables us to see the world, not as a place of death, decay, and defeat, but as a place waiting, groaning toward God's final victory. The change that took place has been described like this. "Their lives prior to this moment were like a smouldering fire that gives no light, just smoke to cloud things up. But once they came into the presence of the Risen Lord their hearts were ablaze! A burning fire gives light for all to see, and they saw, understood and believed! All because of the Risen Lord! Jesus’ victory became their restoring hope. It became the anchor of their lives" (author unknown). This story about the walk to Emmaus is a story for every day life in 2002. If you are walking the Emmaus road right now or when you will walk it in the future with those sad Ds - disappointment, doubt, disillusionment, defeat, discouragement, despondency, depression, and despair – let’s remember we are not walking alone. The unseen "stranger", the risen Jesus is walking with us. Christ is the Saviour and hope of the world! When our Emmaus road is filled with discouragement and despair, let’s walk it with Jesus. Walking with Jesus, our road will become a great highway of companionship, conversation, belief and hope.